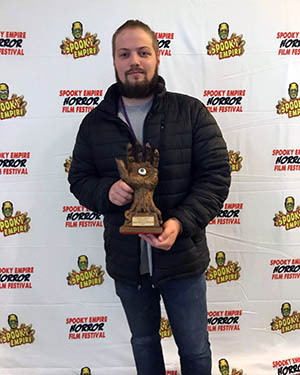 Gregory Vogt's short film, Something Within, won Best Special Effects at Spooky Empire's International Horror Film Festival, held Oct. 27-29 in Orlando, Fla. Additionally, his film was a runner-up in the Best Short Film category. Learn more about Vogt in the story below. "Greg Vogt is going places. Practice makes perfect and he is cranking horror shorts out at a rapid pace, fine-tuning his look and developing his style." Tell us about your festival experience. My experience at the festival was amazing and eye-opening. I met famous horror idols and filmmakers. It was great to have my film accepted and play against some of the best horror films in the world, all while being a winner. 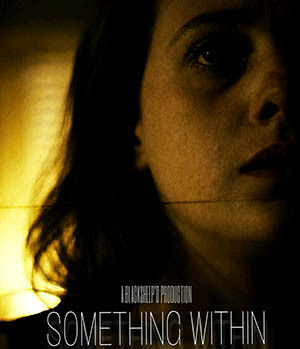 My short film Something Within won for best special effects. What led you to enter your work to this competition? I found the festival on filmfreeway.com. I thought, why not try to send my film? You have to take chances to get anywhere, and looking at how popular and grand this festival has been in the past, it's a chance to get a wider audience looking at your work. I created the film for my own production team, Blacksheep'd Productions. The film is about a young woman who encounters an unusual occurrence in a house she's watching over, but soon learns there's something sinister hiding within. This is our fifth short film this year, with another in post-production and a big shot in the coming weeks. We are ultimately turning these shorts into an anthology feature film with a main storyline, and then looking for distribution. Did you have any networking opportunities at the festival? Being in the festival was a way to have the world see my work. I met so many filmmakers who took interest in my work and got to talk with many popular filmmakers from around the world, with possibilities of working with them in the future. I was told by many, including the people who run it, that my film was one of the few to make people scared and jump. I was also the youngest to be selected. What have you enjoyed most about the cinema arts program? What I enjoy most about Point Park's cinema arts program is it's testing what I can do. They have limits for films that make you think outside of the box. When I do films outside of school, I have no limits, but in the program I have to adjust and work within their rules, which can be a test for real-life clients and future employers. Plus, the program allows me to showcase my work. What are you looking forward to before graduation? What I look forward to the most is the opportunity to work with talented filmmakers in the program, and gaining new team members for future projects. Also, I'm excited to dive into Production 3. I've heard horror stories about it, but filmmaking is what I do and want to continue doing. So, I see no horror about it, but rather a test of the real world, that I'm ready to bring my own spin to it and knock it out of the park. I would not be where I am today if it wasn't for having people believe in me. I'm chasing after one of the hardest things in the world, but having support and belief will help me accomplish it. Also, I have to thank my entire Blacksheep'd team and Point Park teachers for being behind me. Especially Monica Ferrara, a collaborator on my films, who has been there from the start. Finally, keep a look out for new/great scary shorts from my team.